Set in the Aravis mountain range between Lake Annecy and the Gorges d'Arly, La Clusaz and it's smaller neighbours, Le Grand Bornand, St Jean de Sixt and Manigod, are delightfully unspoilt Savoyard villages, situated a little over an hour's drive from Geneva airport. The area has been popular with French visitors for many years and has retained its traditional charm and character. La Clusaz's skiing spreads across 5 mountains - Beauregard, La Croix Fry-Manigod-Merdassier, L'Etale, L'Aiguille and Balme. These are all lift linked to one another by more than 50 lifts. The big area covers all kinds of slopes from large wooded trails for relaxed descents, to high summits and steeps. Beauregard is the mountain closest to the village and is regarded as a place for easy cruisers, although with all the slopes below the treeline it's possible to enjoy some exciting tree skiing if you have the technical expertise required. 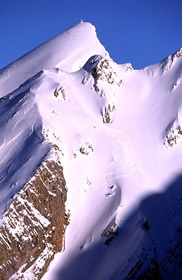 Over the back of Beauregard there are the Croix-Fry Manigod Merdassier slopes which were linked to the resort in 1985. This is an area of largely gentle slopes, ideal for children and beginners. Right next door however are the slopes of l'Etale, largely above the treeline and much steeper. Neighbouring Le Grand Bornand offers a further 90km of pistes - currently on the same lift pass and linked by the free ski bus. There are plans for a gondola to join the 2 villages. Le Grand Bornand is another traditional French village, just 6km from La Clusaz with which it shares the Aravis Lift Pass. The village actually has 2 areas: Le Grand Bornand at 1000m - the more traditional centre, there's even a farmers' market every Wednesday, and Chinaillon at 1300m, 6km from it's neighbour. cross country skiing, snowboard park, walking trails. hiking, walking, mountain biking, swimming, parapenting, via ferrata, climbing, golf, tennis. very good choice. Having a car widens your options even further and allows you to visit some of the best- reputed restaurants in the area eg Ferme du Loumay near le Grand Bornand. Some lively bars, some relaxed typically French bars, an English-run bar. Some late night bars/clubs. Nice walks, pretty village, pedestrians can easily access some of the mountain restaurants. Not far from Annecy - beautiful lake-side town with good shopping, principal town of Haute Savoie.